A couple of years before I got married (when going on vacation with friends was still “allowed”), my friend Fani and I visited Denmark and Norway. We had a great time, but I probably would have added Sweden to the list if I’d known there would be cake! Nancy of The Dogs Eat the Crumbs picked Swedish Visiting Cake for TWD this week. This cake has been calling my name since I got BFMHTY. It comes together so easily by hand…I probably should have just gone ahead and made it ages ago, but no, I waited. I followed Julia’s lead and swapped out the almond extract for a sprinkling of cardamom. The cardamom, the lemon zest and the almonds on top gave it great flavor. It’s a sturdy little cake but not at all heavy. I was fascinated by the instruction to remove it from the oven while it’s still “damp.” My cake tester was noticeably wet, but the cake really did finish cooking as it cooled. For the recipe, see Baking: From My Home to Yours by Dorie Greenspan (she also has an apple version here on Serious Eats) or read The Dogs Eat the Crumbs. Don’t forget to check out the TWD Blogroll! Looks lovely! I am so wishing I had added the nuts. But I’ll have to satisfy myself with this beautiful cake of your. Wasn’t this sooooo good! Simple… but sooooo good. I can be bad about leaving things excited to make on the back burner until their week comes around, but I guess that’s why I joined the group! I know I will eventually make them! What a great idea to add cardamom instead of almond extract! I really liked this! That is one serious cake! Beautiful photograph! I love the thickness of it – and your addition of cardamom. I’ve got these little seeds that I need to ground and use in something soon. I made both “wet” and “dry” cakes…. both were good – but you’re right, the wet ones continue baking as they cool. Before I went to Sweden, I’ve never tasted desserts with cardamoms in it; I was only used to cardamoms in savory foods. Now I’m a cardamom convert! Love it in desserts and I bet your wonderful cake has that extra punch! I like the height of your cake; mine’s somewhat flat. Great job! From what I’ve been reading on the blog posts, there are cakes like this all over Sweden – might need to schedule a trip there! But with a cake this easy, staying home and baking is an option also. Love your cardamom version; sounds absolutely delicious; I’ve loved cardamom in cakes ever since the TWD dimply plum cake. Thanks for baking along with me this week. 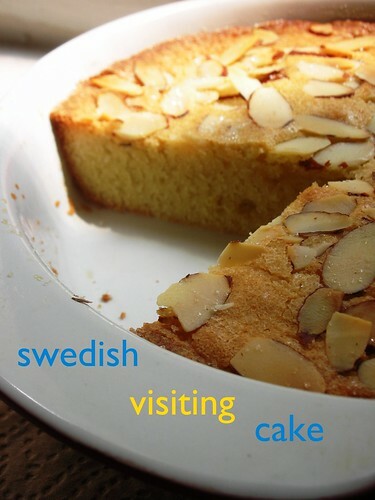 Many years ago my husband and I went to Norway and I can’t wait to go back again – I’m hoping there’s a side trip to Sweden involved 🙂 Your cake looks lovely and I’m with you – it was delicious! I made a half recipe. I used a little ceramic pie plate…I think it’s 5 inches, so that would have made it a bit taller than if I’d used a 6-inch cake pan. I love reading everyone’s version, I have made so many notes/tips/twist to the recipe for the next time (which will be this thursday) to try. I would love to try the apple variation. I can see it tasting even better than this, if that is possible. Great swap with the cardamom. I may have to try that next time! Hehe – I think I’d go to Sweden just for this cake too 🙂 Yours looks amazing! Cardamom? I love it in bread so why not in this cake. Bet it was absolutely delicious! I love the addition of cardamon in the cake, yum! Nice picture. I have never used cardamom before…I really do want to try it though. Glad you enjoyed this tasty treat. Ciao ! What a nice cake you got !! I wish I had used the cardamon !! Oh my! I simply love the look and sound of this! MMMM!!! Cardamom. Great taste addition. Wonder how Chai spice would be. Have to try that. Looks like a beautiful cake. My husband’s Finnish so we’ve always enjoyed cardamom. It would be a great addition to this recipe! Great photo…your cake looks just perfect! This one was a huge hit around here…can’t be making this one too often as I would be eating way way too much of it! I haven’t made this one yet but I should add it to the list.